After noticing a considerable amount of raving reviews regarding the Maybelline 'Colour Tattoo' cream eye shadows, I decided to invest in one to see if they really are as good as a lot of people say. 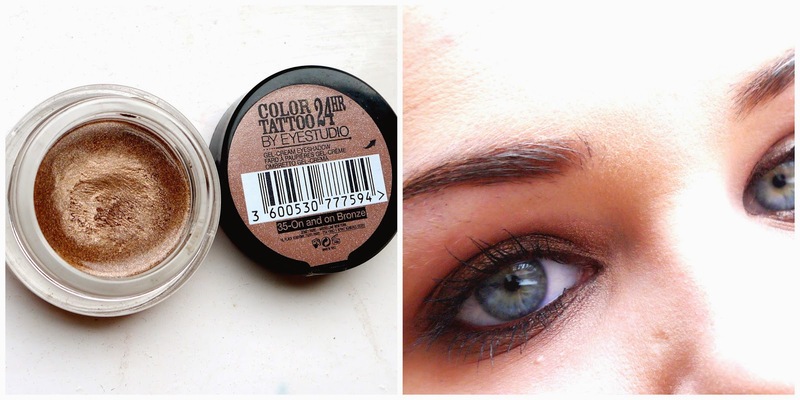 I decided to try the shade 'On and on bronze' as it sits within the colour palette that I like to wear on my eyes. 'Toasted' from the Urban Decay - Naked Palette #1 as both shades compliment one another, being warm toned. The gel consistency of the Colour Tattoo is lovely and creamy and easy to apply with a flat, synthetic shadow brush. I love how the pigmentation looks wet when it is actually completely dry and the staying power is amazing this eye shadow is marketed as 24 hour wear and that it is. The shadow doesn't budge at all once it is applied and better still, zero creasing. I do have to say though that it takes a rigorous cleanse to remove the product from the eye completely. I am really, really impressed with this product and I will certainly be purchasing other shades as for £4.99 you get a generous amount of product to work with. Have you tried the Colour Tattoos?